An unglazed biscuit porcelain ink grinding stone of circular form, contained within a circular box. 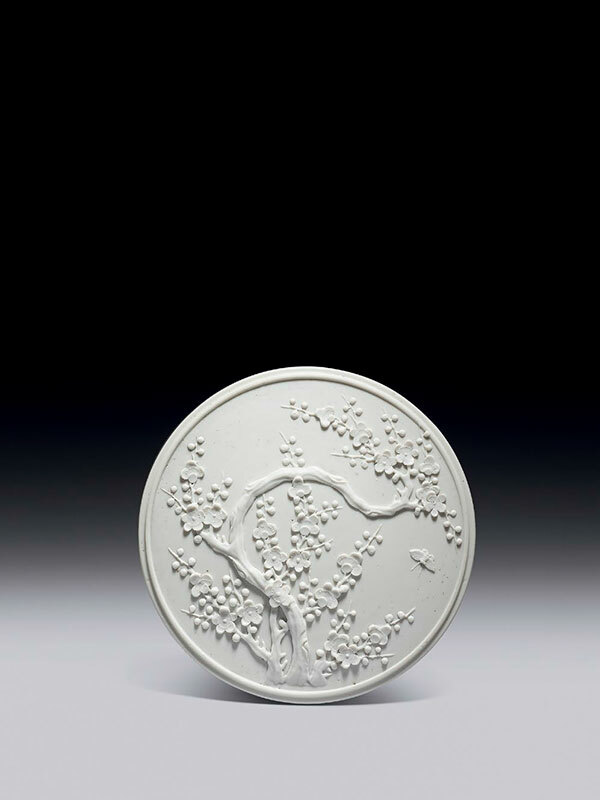 The flat cover is carved in high relief with a butterfly flying among branches of plum blossoms and buds. The scene is encircled by a raised band. The concave ink-grinding slab is raised from the box and set in a deep water-pool in the form of a gutter. The rims of the cover, box and the straight sides are beaded. The box is of an even creamy white colour. This elegantly made ink slab contained in a box is a fine example of a scholar’s piece popular in the late 19th century. 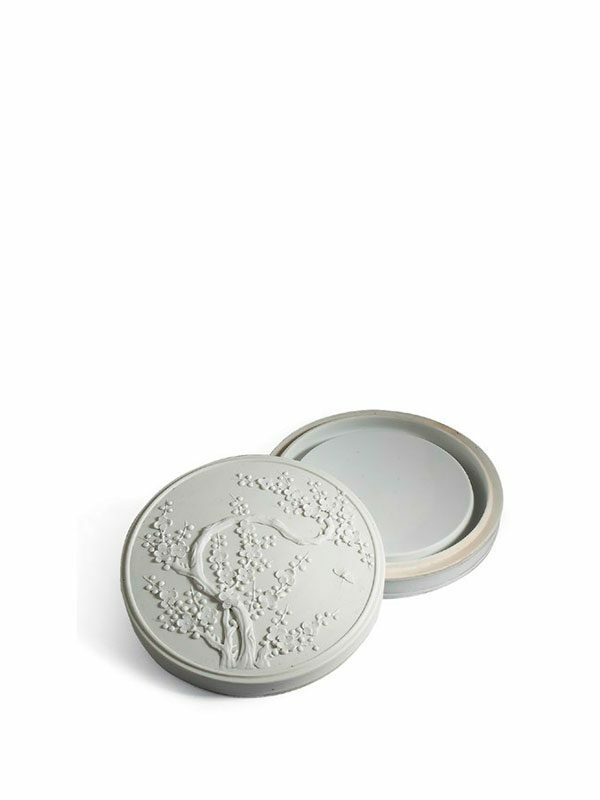 The biscuit (twice fired) porcelain body, a type of unglazed porcelain with a matte appearance and texture, unusually retains the simplicity of its original purpose. An ink stone or slab is one of the essential writing tools on the scholar’s desk. In order to make ink, an ink stick is ground on the slab surface whilst water is gradually added. 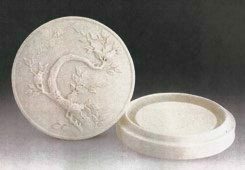 Circular ceramics ink slabs have a long history in China, and it was in the late Southern Dynasties period (5th – 6th century) that the surface of the ink slab was raised, resulting in a drainage channel all around. This type is known as a piyong ink slab and might have been the prototype of the current example. The carving of porcelain (diaoci in Chinese) was inspired by carvers of other materials (i.e. ivory, bamboo and lacquer) and came into fashion in China towards the end of the 18th century. The decoration is carved when the porcelain has dried to a certain hardness but before it was fired in the kiln, creating a threedimensional effect with a depth that is not available in painted porcelain. Butterflies often symbolise beauty, romance and dreams; the depiction of flowers and butterflies together is a sign of a ‘permanent feeling of affinity’ or conjugal fidelity. A closely comparable biscuit porcelain ink slab in the collection of Humphrey K. F. Hui in Hong Kong, carved with pomegranate branches, similar in form and size, is dated to the Daoguang to Guangxu period (fig. 1). Another example of similar form and size, carved with a landscape on the cover and dated to the Guangxu period (1875 – 1908), is one of a desk set that comprises ten pieces and is in the collection of Tony Miller.